This page includes selected articles from the 2003 issues of Across the Fence Post. Fellow Badger Stamp Club member, John Pare, wrote a very interesting and informative article in the April 2002 ATFP concerning Bermuda and Censored Mail in WWII. Of particular interest to me was his section on Transit Mail and how it was processed by the Imperial Postal and Telegraph censorship Department. How could this interest a Greenland collector? Germany had overrun Denmark in April of 1940, but people in Denmark still wanted to communicate with relatives or business/government associates in their colony. The best available method was to send mail via the USA before and even after December 7, 1941. This was done by sending mail on the Trans-Atlantic clippers (airplanes). Most of these flights were flown by PAN AM which had terminals in Lisbon, Portugal and Marseille, France. However, mail still had to be handled in a specific way because of German involvement and the specific routes involved. 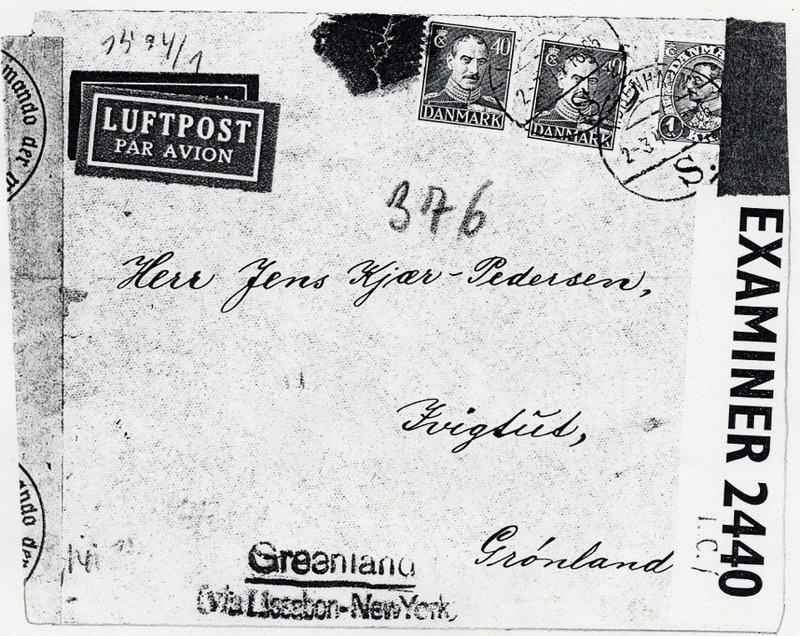 Most, if not all, mail intended for Greeland from Denmark had to have a special route marking hand stamp applied: “Greenland (via Lissabon - New York). 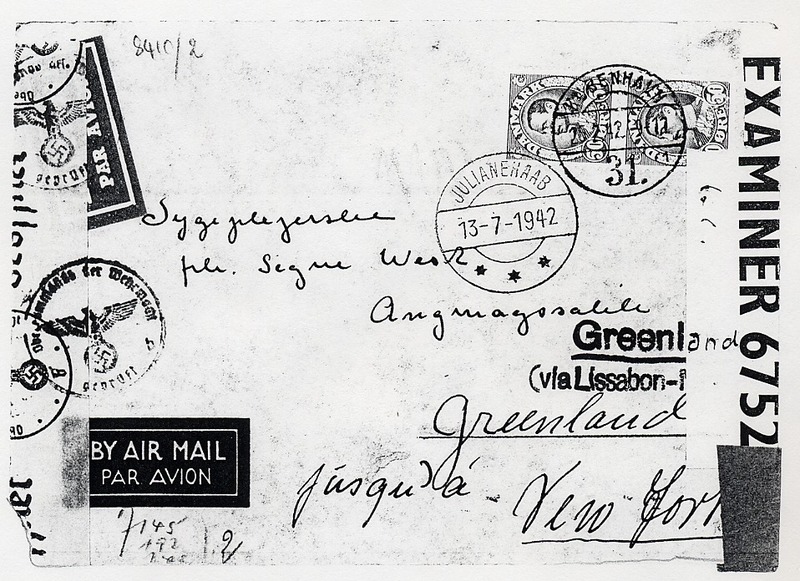 The Germans also had to censor the mail before it got to Portugal. 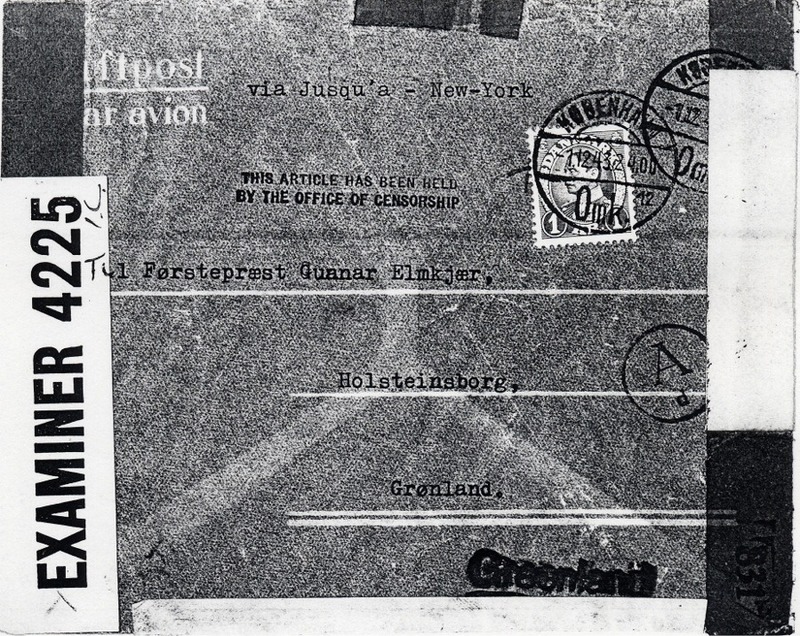 FIGURE 2, dated 6-7-42 shows much the same process as to route marking and German military censorship in Berlin. This time the examiner is #3707 and the “I.C.” code was once again hand written, but this time somewhat more boldly. FIGURE 3 started its journey 2-3-44 from Copenhagen. It was censored in Berlin and intercepted in Bermuda. By this time, P.C. 90 labels were being overprinted ahead of time or a rubber stamp with “I.C.” code was in use. This is shown when Examiner 2440 used a P.C. 90 label with “I.C./” wat was no long a manuscript/hand written notation. FIGURE 4 started its journey 1-12-43, but it was censored by the Germans in Munich rather than Berlin. A civilian “Ad” in a circle was applied, and it seems that it was not censored by the German military. The same route marking “via Lissabon....” was applied and the cover was also intercepted and censored in Bermuda by Examiner 4225 this time and with a manuscript “I.C.” What makes this cover more interesting is that it was censored once again in the United States and an “Examined By 8317” censor tape was affixed. Then the censor decided that the letter should not be sent onward and a “THIS ARTICLE HAS BEEN HELD BY THE OFFICE OF CENSORSHIP” hand stamp was applied. By the date of the back stamp, the cover was held until September 12, 1945 before it was released. It is interesting to note that this was the only one of my four covers that was censored by the United States authorities and seized by them. Perhaps the British censors found something suspicious and alerted their counterparts in the USA. I have three or four other covers in my collection that are dated earlier than the 1942-44 covers illustrated above. However, they do not have an “I.C.” designation on them to definitely pinpoint a Bermuda connection. It is a good bet that they also traveled this route as 90% of mail between Europe and North America was examined/censored in Bermuda. This also includes a good deal of mail that was “Released by Prize Court” after the War. But that is another story that deals with “Detained” mail. It is fascinating at times to realize that even though you can collect the postal history of one particular country, world events or a particular time frame or travel route can cross over into another philatelic domain. Editors note: Charles Shoemaker has been a member of the Badger Stamp club since 1996, but he has been a stamp collector for over 40 years in Wisconsin, New Jersey, and Canada. Charles collects Greenland, with an emphasis on the “American Issue of 1945” and Greenland cinderella material. Until recently, he also collected military/censored covers. He has volunteered his time to the WFSC by distributing ATFP, chairing the Committee on Exhibitions for WFSC, and serving as the Exhibits Chairman for Danepex. Charles has exhibited at both the National and International level. I have been asked to review two of the score sheets which have been included with The Manual of Philatelic Judging, Fifth Edition. Neither scoresheet is new. However, for those exhibitors fairly new to preparing thematic exhibits, it would be wise to know something about what the judges will be working with when assessing your exhibit. There are several major differences between the Multi-Frames and One-Frame score sheets in the minds of the judges. 1. The Multi-Frames score sheet was prepared by an American Topical Association committee back in the mid-1970s. I served on that committee. It was structured on the then FIP score sheet with medal levels five points lower in each category for national competition. The One-Frame score sheet was developed by the American Association of Philatelic Exhibitors in the late 1980s and has had minor changes several times since. It is now the only score sheet without a breakdown in points within each sub-category. I am certain that a change will be coming along one of these days. Otherwise, for example, you have to hope that the judge realizes that giving six out of ten points is the Bronze level that he wanted to give and not something higher. 2. For the Multi-Frames exhibits, judges are instructed to study the exhibit three times in three passes. First pass is judging for Presentation, second for Thematic Elements, and third for Philatelic Elements. It is hoped that very good or very bad in any one category will not be reflected in the points given in another category. However, if at the judges’ critique, a judge asks were a certain item is because it could not be found and you reply that it is there, you know that you lost points in Presentation and in one of the two Elements. Simple as that. While it is not obvious, the point spread in each category does have an important function. If you add up the lowest points in the Very Good, Good, and Passable columns, you will get the lowest points awarded the Gold, Silver, and Bronze medals. If you consistently get points between two adjacent categories, you will most likely end up with a High Gold, Vermeil, or Silver Bronze medal or a Diploma. The One-Frame score sheet or evaluation form does not group the sub-categories but primarily goes from Thematic (4 sub-categories) to Philatelic (4 sub-categories) to Presentation (1 sub-category) plus two bonus categories (both Thematic). The definitions of the sub-categories are basically the same as used in the Multi-Frames exhibits. There are no passes past the exhibit because there is only the one frame. The score sheet can be a very valuable tool for understanding where you need to improve, especially if you are not present for the judges’ critique. 3. If the judges see something that they do not like in a Multi-Frames exhibit, they might ignore it and not take points off. It all depends on how major it is in the overall thematic story line. If the same thing happens again, points will definitely be taken off where appropriate. Judges do not have time to look at every page or every item, but hopefully among the five judges, somebody will have seen all your good items as well as the ones they do want to see. On the other hand, if they do not like something in a One-Frame exhibit, depending upon how much that something is on the page, you will lose points. The rationale is that each page is worth just over six points apiece, there is no way to ignore the item, text or placement, and you as the exhibitor will suffer. No item or text is going to be missed as many judges spend as much time judging a One-Frame exhibit as they do a Multi-Frames exhibit because of the score sheet. That means they are apt to read all texts and see every item. Use that to your advantage when preparing your exhibit. 4. In the Multi-Frames exhibit, pages should be reasonable full, not crowded, but also not sparse. As all judges are also exhibitors, they will understand when you have a problem with getting reasonably full and will probably give you a possible solution at the critique or at the frames. In the One-Frame exhibit, the judges will be looking for fuller pages, usually the margin has been decreased from one-inch all around to 3/4-inches on the top and sides. Bottom margin should remain at one-inch because of the various ways pages are placed in the frames. 5. In the Multi-Frames exhibit, the judges are going to look for a Title Page and a detailed Plan Page that tells them just what they are going to be seeing and judging. If you sent them to the show committee ahead of time, very good. However, they will look at what is in the folder to see if it is the same as in the frames. If it is not, the ones in the frames are the ones they will use. Hopefully, you will have put the Plan Page chapter and/or sub-chapter headings at the top of all your pages so that the judges always know where they are in the exhibit based on the Plan Page. Needless to say, if any judge is confused, your point count will go down unless the other judges have figured it out. They will also determine whether the Title Page and Plan Page cover a logical period in the theme being shown and that the material of that period is included in the exhibit. For instance, if your title is “Olympics” and you do not cover from 1896 to the present, you will lose points for not being all inclusive. Also, if you say “Olympics - 1932 to 2002,” they do not want to see any reference to earlier Olympics. In the One-Frame exhibit, the luxury of the Title Page and the Plan Page are not needed or warranted. Usually, they share the first page along with an interesting item or items which could be the start of the first chapter or sub-chapter. The Title should still encompass what will be shown in the frame. The Plan will be much simpler because of only the sixteen pages. The One-Frame exhibit is also supposed to be all inclusive based on the Title. One does not show “Dogs” in one frame. However, dogs native to a country might be covered in one frame. One-Frame exhibits are usually on topics for which you can not find enough material for a Multi-Frame exhibit. Often, that can change in a few years after learning about material that you were not aware of at the time or after new material gets issued around the world. I have a prime example of that. When I showed my “Ladybugs” exhibit the first time in 2000, I struggled to find enough material for the One-Frame exhibit. A lot of material was issued in 2000 and 2001 (I sometimes think it was issued just for me, but I do know better) plus older material that I had not known about, so I showed the exhibit in 2002 in four frames. Now, I have more than enough material for five frames, and I will be showing five frames at the ATA show in Denver this year. This exhibit will include a cancellation prepared with me in mind and I also have the original drawing to include in the exhibit. Mary Ann A. Owens stated collection stamps in 1960 when given the set of 1957 seven Elephant stamps from Laos because she was already collecting elephant miniatures. She joined the ATA after seeing an article about the ATA in the Milwaukee Journal and first exhibited at WISCOPEX in Wauuatosa in1963. Since then, she has showed the Elephants all around the world while expanding to other thematics like The Blue Danube River, Umbrellas and Parasols, and the U.S. Transportation Coils. Mary Ann has also collected and sometimes exhibited the other disciplines, but she has always come back to thematics. The above exhibits have been sold and now she is concentrating on Ladybugs, The Badger, and The Aspinwall Connection (a display exhibit on her genealogy). Mary Ann was a Wisconsin State judge from the late 1960s until 1980, an ATA judge as of 1969, an APS judge as of 1974, and an International judge as of 1975, though she is now retired from judging. Appointed to the USPS Citizens’ Stamp Advisory Committee in 1979 while still living in Wisconsin, she served on that organization until her retirement in 1997. She moved to Brooklyn, NY, from Waukesha in 1980. For her significant achievements, Mary Ann A. Owens was inducted into the Wisconsin Hall of Fame in 1977. She received the ATA Distinguished Topical Philatelist Aware in 1969, the APS Luff Award in 1991, and signed the Roll of Distinguished Philatelists in 1993. Third-Class mail dates from 1863 when the Post Office Department placed all services into three categories. The Post Office designated First-Class for letters and Second-Class for newspapers. Third-Class was a catch-all class used by individuals and business firms. This article is not designed to be a technical study, but rather an introduction to Third-Class mail as an interesting collectable. Former Postmaster General Marvin Runyon is given credit for Third-Class mail’s current name--Standard Mail, in use since January 2001, which was changed from "Standard Mail (A)" in use since July 1996. The name "Standard Mail (A) was not liked by postal employees, and never understood by the general public. Even business mailers using that class of service found it easier to call it "bulk business mail" or just "bulk mail." The general public knows it by a different name, calling it "junk mail." I’m sure there isn’t a person who doesn’t know that term, but you are hearing it used less by postal employees. In 2002, Standard Mail was the second largest revenue segment for the USPS and its employees know it is a large contributor to their work load and pay checks. I know from my working days in the book publishing field that sales generated from our direct mail were important to my firm’s business success. New employees at our firm quickly learned that we didn’t call it "junk mail." In 1999, Standard Mail was segregated such that the general public no longer used this class. Prior to that, the public used it for small packages up to one pound, and could send envelopes, with some restrictions, at Third-Class rates, which for years were about half First-Class rates. This was most evident for the mailing of Christmas cards, which could be sent at different times for 1-cent, 1 ½-cents, or 2-cents each. In general the rules were no letter enclosed and the flap tucked in. Only your signature personalized the greeting. These lower rates ended in late 1967 when First and Third-Class rates were the same for the first few ounces. Covers showing this use are still fairly common in dealer stocks. It is interesting to watch mail being taken out of post office boxes. The decision is quickly made as to what mail has importance and which mail can be deposited in the waste basket before departing. Matching direct mail to the right customer is not as easy as it may at first appear. The more successful companies do it better than most. As marketing costs and postage rates go up, I’m always thinking I’ll get less bulk mail…but that hasn’t happened yet! The rate chart for Standard Mail today includes several hundred different rates, broken down into two major areas: Regular (commercial firms) and Non-profit mailers. The next breakdown is by type: letters that can be machine processed, and non-letters that often need hand processing. Even this is changing as new processing equipment is now being installed that can work with larger and heavier matter. A further breakdown is for items less than 3.3 ounces and items over that weight. Then lower rates are offered based on additional work-sharing done by the mailer. Those with small quantities often pay the post office to do most of the sorting, but larger mailers can do sorting in-house for less expense. They deliver the mail to the post office in some cases sorted ready for the carrier to take on the street without additional work. You cannot look at most Standard Mail today and know for sure what rate postage was paid. Three or four variables apply to any mailing. Items posted today can have the postage paid in three basic ways: Non-denominated stamps, pre-printed indicia, and meter indicia. Of course, the meter imprint tells you how much was paid and will let you find the rate on the chart. Even this is not always true, at times the same rate may apply to similar, but not identical mailings. Starting in 1974, a 6.3-cent stamp was issued for bulk mailings. These stamps with a decimal point in the value expanded into the transportation series of coil stamps, and are a help, but not a guarantee, of being able to date bulk mailings. As postage rates were adjusted and new rate stamps not ready, a new variety of mail came into play. Collectors started calling it "false franking." The USPS allowed the use of old rate stamps after the new rate was effective and the difference in postage was paid by the sender at the time of mailing. I have seen estimates that as much as 40% of bulk mail is never opened. Interestingly, people in the industry claim mail with postage paid with stamps is more likely to be opened. This means the USPS has an on-going market for its non-denominated stamps. They have even taken the suggestion to make these stamps more colorful and change the designs on a regular basis. Appreciating and collecting Third-Class mail has several challenges not always found with First-Class mail. By design, modern bulk mail stamps require no canceling and no postmark showing a date. Even in earlier periods, stamped Third-Class mail could have the stamp cancelled, but with the date slugs removed. Early pre-cancelled stamps also required no postmark showing the date. Meter indicia also required no dating. Placing a date on items is a detective challenge accepted by all. Starting points include identifying the stamp and its proper period of use, or the use period of stamped envelopes. 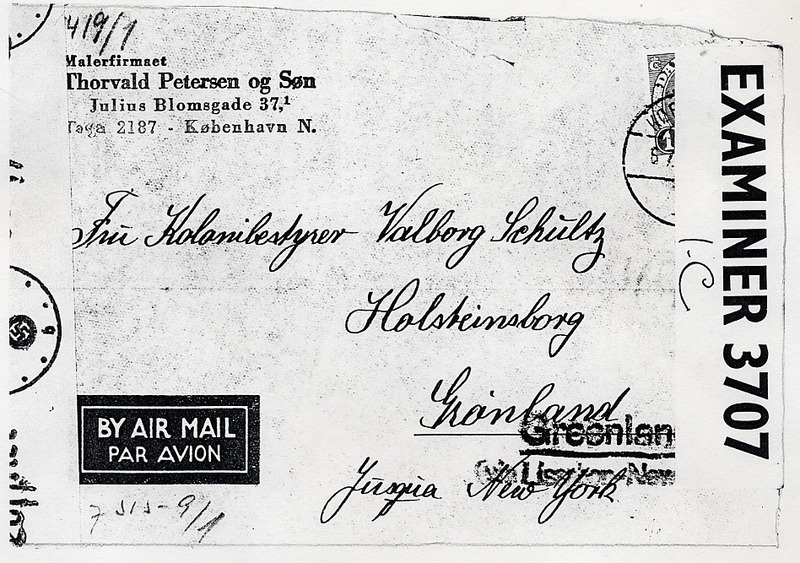 Having your postal history find include the contents often provides dating. A study of the rate structure through the years will give you a general idea that can be refined by checking a rate reference source. Rate reference books have been published a number of times. Some early efforts only covered First-Class rates. A 1956 Post Office Department publication covered the early days of Third-Class rates. (This booklet has been privately reprinted.) The big break come in 1924 with the publication of U.S. Domestic Postal Rates, 1872-1933, by Henry W. Beecher and Anthony S. Wawrukiewicz. It has been up-dated with rates through 1999 and on the internet with rate changes to 2002. This book combines text material, rate charts and illustrations to tell the story of each class and every sub-class of mail in use. Although the book looks imposing, seldom do you need more than ten pages to isolate a rate and period of use. Each section has complete source references and enough footnotes that cover the exceptions that can make a search just a little maddening. The 1999 edition has added information in the form of an appendix covering payment of postage by meter stamps and permit imprints. I feel in just a few short years this publication has become the reference source of choice. I have made the switch from collecting only stamps to studying postal history. The challenge is to take what at first glace is an ordinary item of mail and try to tell its story from placement in the mail to proper delivery. Answering questions on what class of mail was it and was proper postage paid. Other questions revolve around if it was handled "by the book" or did something happen to cause extra postal markings to be placed on it. You even get luck now and then with items getting postmarked with a date by mistake. Today, the USPS is upgrading its buildings with space called the Bulk Mail Acceptance Unit. The unit employees are the gate keepers who control the flow of Standard Mail into the mail processing stream. They process the forms, track the payment of postage, and review to see that each mailing conforms to the regulations that apply. These workers are not seen by the general public, but are appreciated by the person at your church or club that gets the monthly newsletter out. They also deal with the mailer who backs a semi-trailer to the dock with a hundred thousand copies of your grocery store sale flier. With a lot of effort that direct mail item with the sale prices starting on Thursday will be in your mail box on Tuesday or Wednesday. For your Information: Henry W. Beecher and Anthony S. Wawrukiewicz’s U. S. Domestic Postal Rates, 1872-1999, 2nd edition is still available from your philatelic book dealer or direct from the publisher—Cama Publishing Company, P. O. Box 19730155, Portland, OR 97280. It’s $44.00 price includes postage for the soft-bound or $55.00 for the hard-bound. Over the years Wisconsin has issued a wide variety of revenue stamps which are a challenge to collect. Some are currently and readily available. Others have not been used for more than fifty years and pose a far greater challenge to find and acquire. The earliest Wisconsin revenue stamps were beer or fermented beverage tax stamps. The sale of beer with 3.2% or less of alcohol became legal on April 1, 1933. Starting August 1, 1933 Wisconsin began to issue stamps to collect a tax of $1 per barrel of 31 gallons. The stamps remained in use until August 31, 1953. These stamps were issued by the millions, especially the ones placed on cases of 24 twelve ounce bottles. Despite their wide use, they are not commonly found. Stamps placed on odd sized packages (such as cases with 12 ten ounce bottles) are quite scarce. The general scarcity of these stamps is probably attributrable to the fact that the law that required them to be destroyed upon the emptying of the case or barrel to which they were affixed. A larger reason seems to be a generalized apathy for collecting stamps that are not pictured in stamp albums. The beer stamps were printed in attractive colors on white paper. Most were perforated cancelled with the initials of the breweries. A collection of these stamps is a fascinating reminder of the many small breweries that have vanished from the scene. The stamps are attractive also because they have the amount of tax calculated to as many as five decimal points. The stamps were also specific as to the size of the case or barrel to which they were to be attached. Prohibition ended on December 9, 1933. Starting March 1, 1934, a tax of $1 per gallon was levied on the sale of wine and liquor in the state. The tax on wine was later reduced to 5¢ for wines with less than 14% alcohol and 10¢ for wines with 14% of more alcohol. Bottles on hand on March 1, 1934 were inventoried and taxed. These bottles were identified by the placement of a red decal on these bottles. Thereafter, the manufacturer or importer was required to acquire decal stamps and to affix them to each bottle of liquor. The stamps were subject to strict accounting to the State and do not often turn up in unused condition. Once used, the stamps defied removal in one piece from the bottles to which they were affixed by any but the most patient of collectors. The stamps are generally in the shape of the state and were issued in a pleasing array of colors. The use of these stamps on wine bottles ended in 1949. After that the state began to require the use of large colorful stamps on the outside cartons in which wine is shipped. More on this later. The use of stamps on liquor bottles continued until July 1, 1986. The use of decals on wine ended in 1949 when the state switched to the use of paper stamps on cases and barrels of wine. At first the stamps expressed the dollar amount of the tax. The later issues showed the quantity and size of the bottles of wine. The stamps were issued in green for the wines of less than 14% alcohol and in either red or yellow for the stronger wines. The most common stamps were those for 2.4 gallons which represents 12 fifth gallon bottles. Less common are those for 4 one gallon bottles in a single case. The use of wine stamps ended in 1985. Starting August 20, 1977, the state authorized a reduced rate of tax ($1 per gallon rather than the normal $2.65 per gallon) on liquors if they were distilled from whey or brewing wastes produced in this state. At least one distillery took advantage of this reduced tax and a series of rectangular stamps inscribed “special liquor tax” were issued to reflect the payment of the reduced taxes. The use of these stamps was discontinued on July 1, 1986. Another oddity of the Wisconsin tax law was that pharmacists selling liquor under a special pharmacist’s license for medicinal, scientific or scientific purposes were required to place an additional decal stamp on each bottle. The use of these stamps was also discontinued on July 1, 1986. One of the more unusual series of stamps are those issued for oleomargarine. The sale of colored oleo in Wisconsin had been banned for many years. Starting in 1949, uncolored oleo was taxed at the rate of 15¢ per pound. Stamps were affixed to each one pound package. In 1967 the sale of colored margarine was permitted but it was taxed at the rate of 5¼¢ per pound via stamps affixed to the cartons. The tax ended in 1972. The cigarette tax became effective in Wisconsin on September 20, 1939. The law provided that the State Treasurer was to collect the tax by the use of stamps which were adhesive decals. It also allowed the use of a postage stamp meter stamps as well. The initial tax rate was 2¢ for a normal package of cigarettes. The tax also included tobacco products which were defined as cigarette papers and tubes which were taxed at the rate of 1/2¢ per fifty. By the 1960’s the state also allowed the use of heat transfer cigarette stamps which were ironed onto the bottom side of cigarette packages by an iron configured to affix twenty at a time. The stamps are still in use today and their colors are changed on a regular basis. The use of meter stamps was discontinued in about the 1980s due a concern that they could be counterfeited. Indian tribes in Wisconsin are taxed differently and the state issues a distinctive set of stamps for use on reservations. These are always a different color than the standard stamps and the work “Indian” appears on them. Starting in 1986 rental buildings that were not owner occupied became subject to regulations that they be weatherized. Before a deed to such a property was recorded, a certificate from the Department of Industry, Labor and Human Relations was required. If the property was found to be compliant, a green stamp was issued. If the owner agreed to bring the property into compliance within a year, a yellow stamp was issued for a stipulation by the owner to comply. If the property was to be razed, a green stamp was issued to a waiver form. Starting in 1978, Wisconsin required fishermen and women looking for trout to affix a stamp on their fishing or sports licenses. In the years since, the requirement for stamps was expanded to those hunting or fishing for waterfowl, Great Lakes trout or salmon, turkeys and pheasants. The fees for the stamps are still being collected but the use of the actual stamps has not been required since 1998. A computer receipt is now issued for these fees. Those wishing to have actual stamps receive them free from the Department of Natural Resources upon presentation of proof that they have paid the appropriate fees. 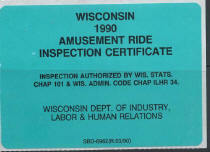 The Department of Industry, Labor and Human Relations began operating an inspection program for rides at fairs as well as a registration program for rides such as mechanical horses at supermarkets. Each year since at least 1980 a distinctively colored sticker has been issued for these devices. Starting in 1991, registered devices received a decal showing the top portion of a map of the state. If the ride was also inspected, a decal was issued that completed the map. An additional tool in enforcing laws prohibiting the use of certain drugs, Wisconsin imposes a tax on all such drugs. The requirement is that persons possessing these illegal substances affix tax stamps to packages containing these drugs. The taxes range from $3.50 per gram or part of a gram of marijuana to $1000 per marijuana plant to $200 per gram or part of a gram of substances the Drug Enforcement Administration classifies as Schedule I and II controlled substances. The tax is still in force, although its enforcement was suspended as a result of a court determination it was unconstitutional. The defects in the law were later corrected and it therefore reinstated. Wisconsin requires that motorcycle operators be tested and licensed. The fact that a cyclist is licensed appeared on the driver’s license. However, the manner in which the Department of Transportation validated a driver’s license immediately after the new cyclist was licensed was by means of an adhesive stamp attached to the driver’s license. The normal stamp was black. However, if the driver was restricted to cycles with engines of less than 501 c.c. in size, a reddish stamp was affixed to the license. The use of these stamps has been discontinued. Truck operators are the subject of numerous regulations. Those operating in inter state commence were required to register their operating authority with the Wisconsin Department of Transportation. In addition, they were required to purchase a stamp from the state for each unit operated within the State. Truck operators were charged a registration fee based on rates set by agreements between Wisconsin and their home states. Later the fee was set at $5 per truck. The stamps were affixed to a cab card. The card was reminiscent of a bingo board since not all states issue the stamps. As a result, they were nicknamed “bingo cards” by those in the trucking industry. Wisconsin discontinued the use of bingo stamps in 1994. Taxes on diesel fuel are a large source of revenue for the Highway Fund. As a means of determining that truck drivers were registered to pay fuel taxes, Wisconsin began to issue fuel tax stickers in ???. To eliminate the need for trucking companies to file separate fuel tax returns in each state, they created an entity called the International Fuel Tax Agreement (IFTA). Under this program, they file a single return with the state with whom they are registered. The states then apportion the fuel taxes among themselves in accordance with the number of miles each truck was operated in the respective states. As a result, IFTA stickers are now issued in place of the fuel tax sticker. Collecting revenue stamps is a fascinating, colorful hobby. “Research” has many shades of meaning in philately. To a collector confronted with a problem in identifying a new acquisition, research might be no more demanding than a check of standard references. Conversely, the owners of the Grinnell Missionaries commissioned intensive studies of the paper, printing, cancellation and provenance of these stamps in the hopes of proving them to be authentic Hawaiian postage stamps—and it will probably be Spring 2004 before the Expert Committee of the Royal Philatelic Society, London issues its own opinion on their status. In both cases, the collector has certain questions about a philatelic item which can’t readily be answered, requiring a search elsewhere. It’s certainly possible to collect stamps in isolation–but it’s unrealistic to consider “research” without investing in some of the elementary tools and without the sharing of knowledge and experience. There’s no substitute for a personal philatelic library. As a minimum, it should include a recent general catalog, one or more standard stamp collecting guides (for example, Cabeen’s Standard Handbook of Stamp Collecting as a starter, the Williams brothers’ Fundamentals of Philately as a more advanced reference), and files of clippings and notes. As collecting interests become more diversified and/or more specialized, the supporting library should grow accordingly. There’s also no substitute for regular contact with like-minded collectors in stamp club meetings, shows and bourses, as well as through society journals. • Consult the specialty groups dealing with the particular field of interest. The APS lists 198 such groups, with points of contact. Most of them have periodicals, some have their own monographs, a few have photocopies of exhibits. Quite a few also have study groups dealing in more narrowly focused areas. It’s also important to remember that a question can apply to more than one group: a philatelic item showing a painting of the Nativity, for example, would be of interest to the Christmas Philatelic Club, COROS, and the Fine & Performing Arts Society (among others), while a German “POL”perfin would touch the Germany Philatelic Society, the Perfins Club, and the Internationale Forschungsgemeinschaft Polizeiphilatelie (IFPOL). For research-related questions, try the appropriate study group chairman or the journal editor; a few societies have active libraries, and in such cases the librarian is a helpful contact. • Electronic communications have greatly facilitated and speed up the process of research. It’s now possible to send text, charts and high-quality images around the earth in a matter of minutes. Additionally, there is a virtual universe of philatelic sites, many with extensive information available for downloading. Those with an interest in U.S. classic stamps, for example, will decidedly wish to visit and bookmark the sites of the U.S. Philatelic Classics Society at www.uspcs.org; Robert A. Siegel Auctions, especially the auction results and the Siegel Encyclopedia, at www.siegelauctions.com; and Richard C. Frajola, at www.rfrajola.com. There’s a helpful listing of philatelic Web sites (over 4,200!) which can be searched by various categories, at http://my.execpc.com/~joeluft/resource.html. • Look outside the philatelic box. By no means should reading and research be confined to postal and philatelic sources. History (economic, social, political) as well as geography play an important role in the development of postal services; see in particular Richard R. John, Spreading the News : The American Postal System from Franklin to Morse (Cambridge, MA: Harvard University Press, 1998). The examples listed above are almost exclusively English-language and U.S. oriented (Negus is a British author, IFPOL is German, and the Canadian Postal Archives obviously are Canadian). However, depending on their areas of interest, readers may find their search for information taking them to foreign sources. Similar conditions apply, and American users will be pleased to find that many overseas web sites have English-language versions. Use care in transcribing research results, especially that found on the Internet. Individual postings can sometimes be more opinionated than authoritative, and what’s there today may be changed or be totally gone tomorrow. Be careful in citing source, location and date, and wherever possible, work back to primary sources. A suggested guide: The Chicago Manual of Style, 15th edition; from your local bookstore, or discounted and postpaid from Amazon.com. And finally, don’t overlook the greatest resource available to the researcher: the librarian. Gini Horn and her colleagues at the APRL are outstanding in their ability to find relevant source material and to suggest new avenues of approach. Cimon Morin is equally adept with Canadian questions. My experiences with the National Archives, the National Postal Museum and other institutions have been similar. --Charles J. Peterson is currently President of the Board of Trustees of the American Philatelic Research Library (APRL). He received the Luff Award for exceptional contributions to philately in 1988 and serves as both a national and international philatelic literature judge. He has edited the Philatelic Literature Review and has served as chair of the FIP Literature Commission.